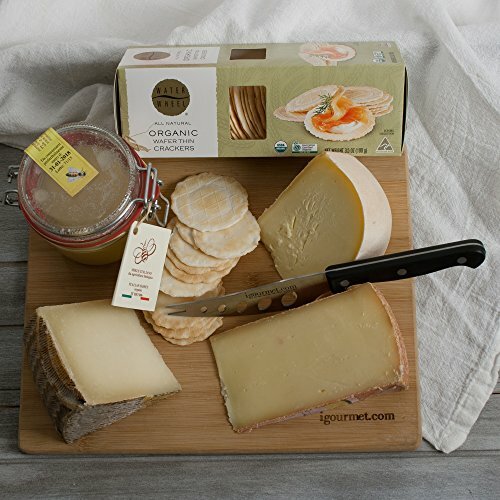 The Gourmet Gift Set Includes Organic Manchego Cheese by Parra (approx 8 oz), Organic Wild Spitz Cheese (approx 8 oz), Le Wavreumont Cheese (approx 8 oz), Organic Italian Honey in Mason Jar by La Bottega della Api (10.6 oz), Organic Crackers (6.5 oz), Cheese Serving Knife, and Bamboo Cheese Board. Wild Spitz Bio is an artisanal farmstead cheese from the foothills of the Swiss Alps. This hard cheese is made from a combination of organic cow's milk (95%) and organic goat's milk (5%). Not only is the milk organic, but it is sourced from grass-fed animals living naturally on lush mountain pastures. This cheese has a complex, nuanced flavor that slowly develops under repeated washings with a salt water brine. It has a rich creaminess, herbal notes, and a mouth-watering tanginess. The sharpness on the finish comes not only from the goat's milk but also the extended aging process. The KaBloom Gift Basket Collection consists of a variety of gourmet gift baskets including cheese gift baskets, chocolate gift baskets, charcuterie gift baskets and More!